Two finishes this week -- pieced, quilted and bound! Had to include my quilt-hanger's chartreuse running shoes. They just match the flange on the binding! I quilted this modern quilt in straight lines. For some reason, Meggie (my long arm Mega-Quilter) didn't like the thread I started with. 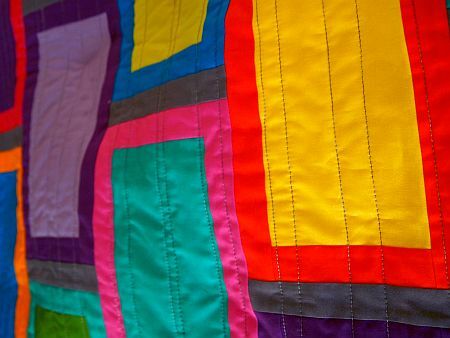 It was Superior Thread's "Omni," and I've used it many times before, but not for straight-line quilting. I tried two different spools of the same thread, and three different bobbin threads. When I finally tried King Tut on the top and Omni on the bobbin, it worked fine. 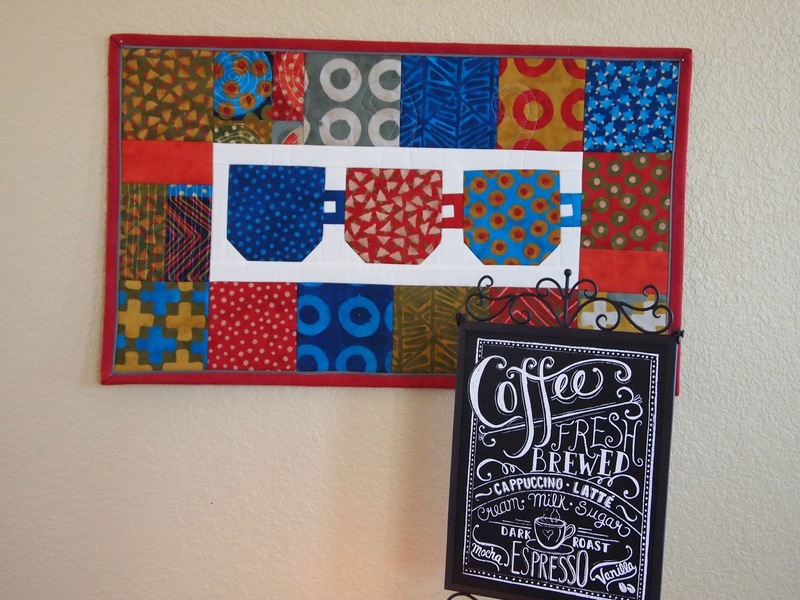 Next, I finished this Charm School wall hanging. The pattern is "Tea for Three" by Sandy Gervais for Pieces from my Heart. The fabric I used is a charm pack of "simple marks" by Malka Dubrawsky for Moda. 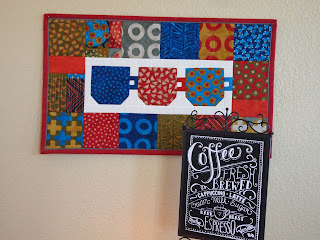 I had to finish it to go with the cute "coffee" sign friends Kathy and Becky sent me from Idaho. Doesn't it make a charming little vignette? I just need to add one of my Starbucks mugs from China. Or Ohio. Or Ireland! Here is a detail of the quilted "steam" rising from the mug. Thanks, Beck and Kathy! Linking up to TGIFF at Amy's Crafty Shenanigans. 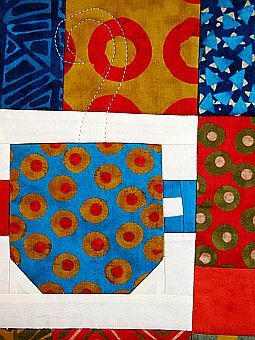 Tomorrow is Front Range Modern Quilt Guild. I'll be sewing the October Jelly Roll Party Sample! Can you believe it's only two weeks until the "unofficial" end of Summer, Labor Day? Love the Brick Road - with or without running shoes. Any Starbucks mug would look great in your vignette - esp the ones still "in transit"!! Love the Brick Road, a really modern look and the wall hanging is really cute. Your 'brick road' is amazing! The colors are a knock out. The coffee cup hanging is so much fun. It goes with your new sign perfectly! I really love that brick road quilt. It is awesome in both color and design. 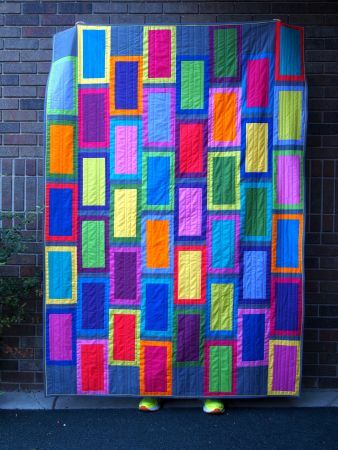 LOVE your brick road quilt. And yay for your chartreuse shoes! I need to see the flange on the binding close-up though - I am intrigued :) Thanks for linking up to TGIFF!